Having had a dry early start to the year, as these things happen it turned wet as silage time approached. So 10-12 days later than it should have been grass bulked up a bit more with more stalk & fibre to it - but it filled the clamp with 100 big bales as well. We rely on contractors to do this & they are always very obliging the grass into the clamp going through a Forage wagon. The chop length is greater than a precision chop machine but it does not seem to be an issue feeding it to the sheep. Anything not suitable for the sheep goes to our herd of Pedigree Dexter cattle which with followers usually numbers between 40 &50. The beef from the herd is either sold as freezer packs or to Swaledale Foods at Skipton who are supplying top class restaurants in London. Funny looking Charollais you say - but having mentioned the Dexters I thought I would introduce you to our other breed of sheep which son Stephen describes as Dad`s pets - these are our small flock of pedigree Teeswaters numbering 20 ewes which we have run for quite some years now. The Teeswater is the sire of the masham halfbred ewe - an extremely hard wearing commercial ewe - quite prolific & good milkers producing lambs with excellent loins. The Masham incidentally crosses very well with the Charollais for butchers lamb production. One other item worthy of mention is that the Teeswater has what is known as a lustre wool which is highly sought after for spinning. Harvest started well & just when we thought it was all going to be quickly wrapped up it rained again, so the last of our straw wasn`t baled until the end of October. Maybe it generates patience! Our 2016 success at Skipton female sale was repeated this year when Ben James of Tenbury Wells Worcs. 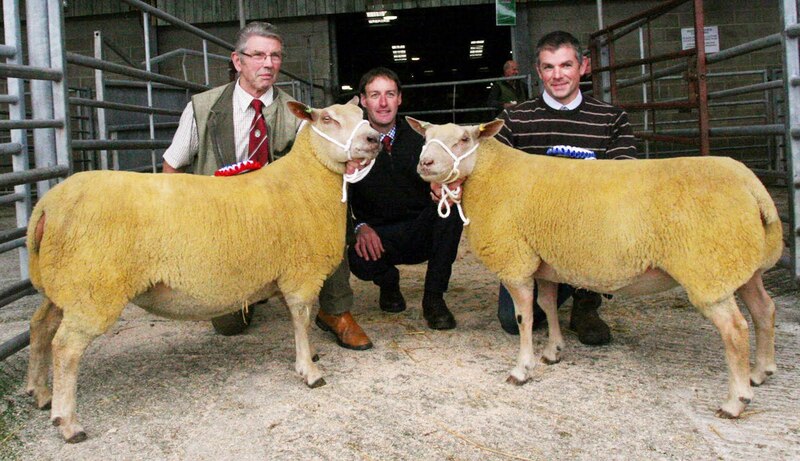 tapped out the 1st prize ewe lamb as Champion & the 1st prize shearling ewe ( a Foulrice Majestic daughter ) as reserve.He subsequently backed his judgement by taking the champion at 700gns & also the 2nd prize ewe lamb (a Foulrice Osprey daughter) at 800gns.He also bought the reserve champion by commission for 1200gns which was the top price for the sale. Rounding the year off we were once again honoured to be awarded in the flock competition,Champion Flock of the Northern Region for the second year running. Another Mount Aloe son out of a Langstone K2 daughter full of flesh with a big gigot - buyers were R Swift & Sons of Church Eaton in Staffordshire. If you think the ram is sulking that's because he was not halter trained & didn`t appreciate the opportunity of a photo call. Time for some catch up as much has happened since my last post of early September 2016. 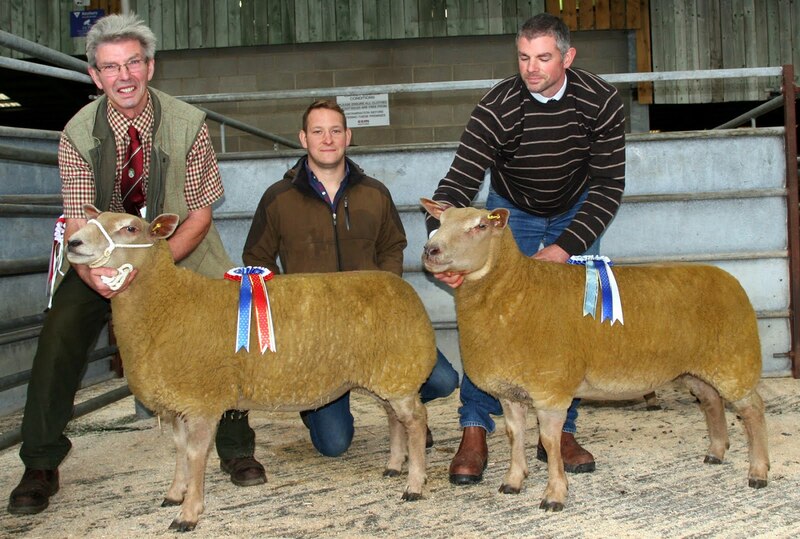 Our September ram sale at Skipton with CCM Auctions & auctioneer Ted Ogden was successful, as you see from the picture below, we took Champion with a twin born shearling ram by our prolific stock ram Dalby Mount Aloe.This sold to Mr Jim Kelly of Market Harborough Leics. 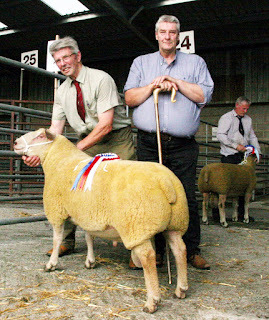 Champion ram pictured with judge Mr James Huddlestone of Arkholme nr. Lancaster. 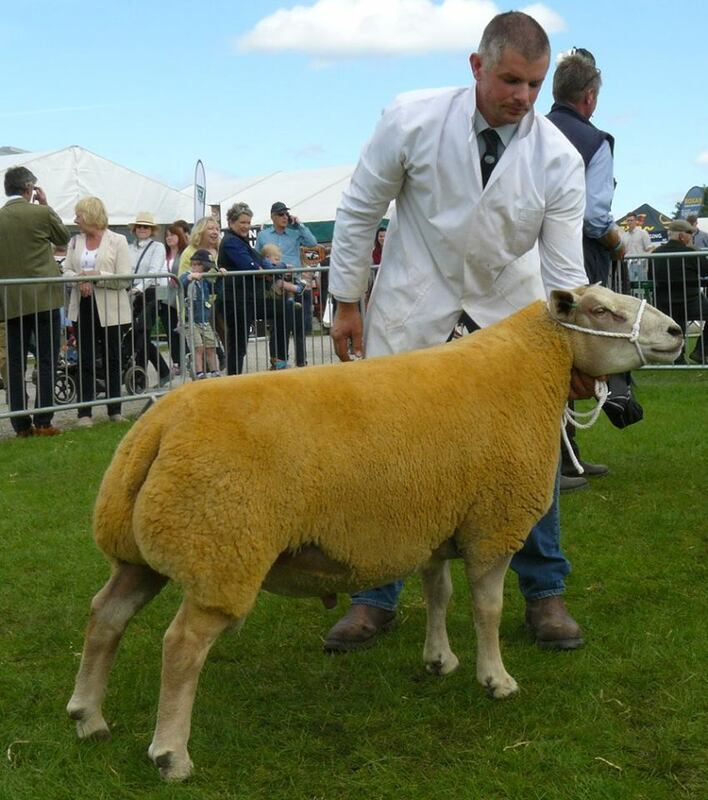 Incidentally we sold another son of Dalby Mount Aloe 14DG04690 in 2015 to the National RamCompare project where he has been used in the commercial flock of Duncan Nelless of Thistleyhaugh Northumberland very successfully; & in the preliminary results announced in November 2017 this ram is the highest placed natural service Charollais ram for overall carcase merit.He also produced one of the largest progeny groups for the trial. This follows on from his sire who as a shearling with natural service comfortably served 100 ewes in a three week cycle. 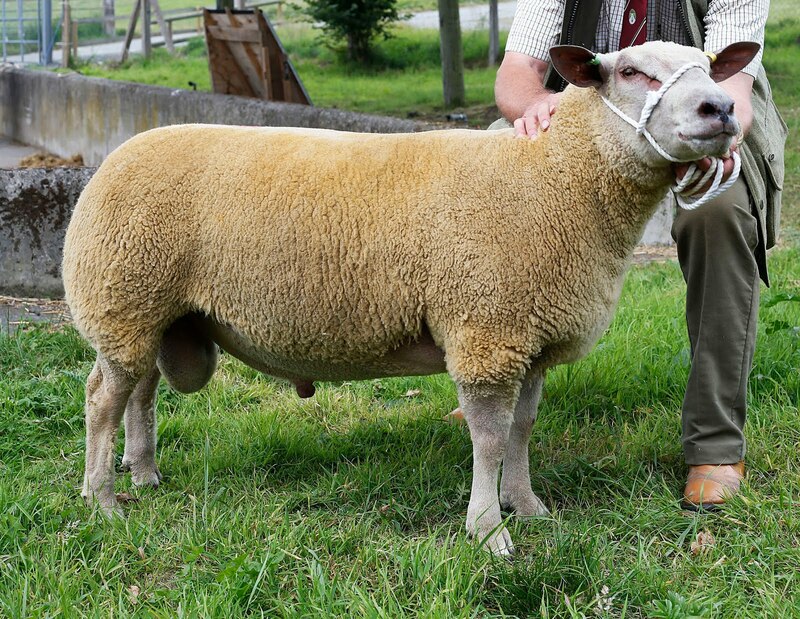 Our top priced Ram lamb Foulrice Rachamin 16DG06107 sold earlier this year to J & J Corbett, in the September 2017 analysis with Signet Breeding is the third highest rated stock ram currently in the Charollais breed with an index of 459 showing exceptional growth & muscle together with a slightly positive fat rating - best for finishing lambs off grass. Next up came the autumn in-lamb female sale at Skipton & under the eye of judge Dave Roberts of Kenley in Shropshire, Foulrice gimmers took both Champion & reserve. 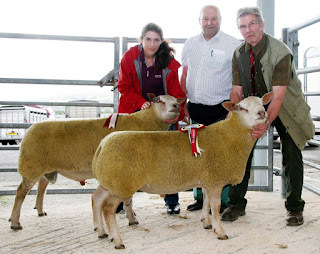 The Champion was purchased by the judge for 800gns carrying twins to Foulrice Osprey.She was surpassed in the sale ring by the reserve Champion which was bought by Edward McCann of Askham-in-Furness, Cumbria for 1100gns, this time carrying twins to our July purchase Bronwydd Ready To Rumble. We not only had a successful sale but we also came away with two purchases of our choice. The first was Stuart Dunkley`s one ram lamb entered ` Hyde Radio5Live ` a very good skinned well muscled lamb standing with plenty of width behind & very good on his feet & legs. The second from Emyr Hughes pen late in the sale ` Bronwydd Ready to Rumble ` incorporating Skelton Whin & Mortimer breeding.This will make a bigger ram than the Hyde lamb but most importantly has good shape & fleshing, & a bit more hair cover on his face. Both lambs have been used on a good number of ewes so its a matter of waiting with anticipation. We have also shorn both lambs bare & still are pleased with the results - so watch this space ! Next up came the Great Yorkshire Show & having won male champion for two years running with Rhaeadr Nock, we were delighted to continue this for the third year by winning the award under the keen eye of judge Johnie Aiken with our home bred stock ram Foulrice Osprey 14DG04650 pictured below being shown by son Stephen .Osprey will be one of the best muscled & correct rams that we have bred & most importantly he is passing it on to his progeny. Worcester Premier sale arrived with haste as it always seems to do, though we were probably a bit better prepared than sometimes, with the weather being a little kinder.Having a number of good ram lambs we ventured to enter two runs of five ram lambs which meant that the second run would be at the end of the sale & as it turned out they were the last ram lambs sold. However even though we did not catch the judges eye there was plenty of buyer interest both on the Friday at judging & on the sale day itself. A strong hard fleshed shearling son of Rhaeadr Nock, with an index of 338, set the pace at 1650gns selling to Mr Griffiths of Llanbydder.He was followed by our last shearling ram a March born son of Foulrice Osprey ( Charollais male champion Gt. Yorks Show 2016 ) with exceptional muscling,& an index of 362 selling at 2000gns to Brian Cornish of Devon. Lot 93 followed a stylish upstanding well fleshed Dalby Mt. 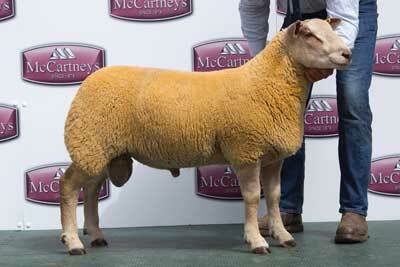 Aloe triplet son - Foulrice Rachamin - quickly going to 4800gns to Jonathan & Janet Corbett for the Wedderburn flock. The next lot another triplet Mt. Aloe son was snapped up by Jamie Wild for his Redhill flock. Our visit to Otley Show was highly successful, as taking five sheep we won four first prizes & one second. 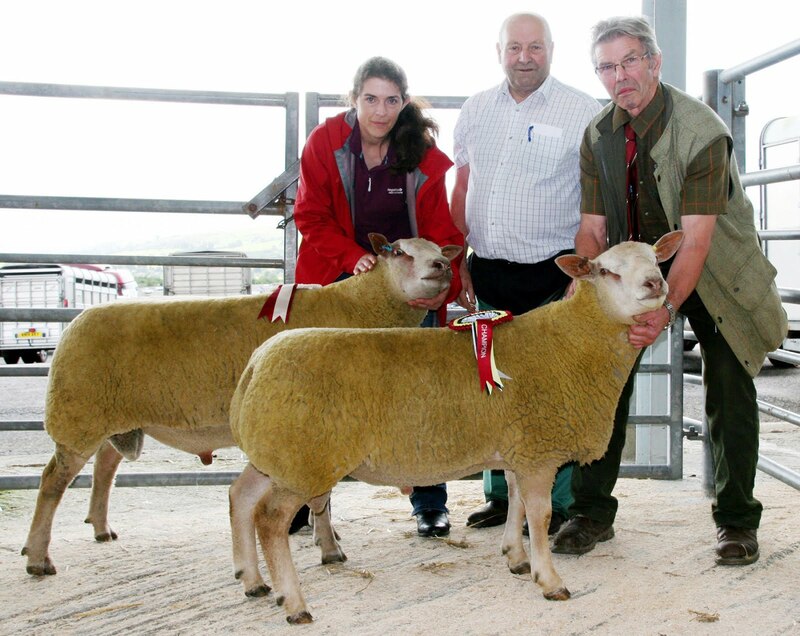 Our show ewe Foulrice Naomi who was Champion Charollais at the Great Yorkshire Show in 2014 took a year out last year as she produced a triplet. This year ( as sheep do ) she didn`t lamb until March, nevertheless thinking this could be her last year to be shown we took her to Otley where she not only won the ewe class but was awarded Reserve Champion. Naomi still as correct as ever as a three shear ewe. Today Stephen has shorn the December born ewe lambs retained as flock replacements.We have done this at around this time of year ( dependant on the weather ) for the last five years, not that it increases their mature size, but as they are just running at grass with no supplementary feed, they actually graze & grow better in their first summer.We also tup most of them so it is important that they are as well grown as possible before pregnancy. A late spring in more ways than one - after it seemed like it would never stop raining - eventually lambing was finished, grass started to grow & suddenly everything was turned out, with the cattle bitterly complaining that they were the last to go; though only when they had finished off some two year old silage. Some of our Dexter beef is now making it`s way, via Swaledale Foods of Skipton, into high class restaurants in London. Not usually venturing into the show ring until the Great Yorkshire Show we were persuaded to take a team to Otley Show in it`s 207th year on Saturday 21st May. Having shown a photo of Osprey bare clipped in my last post several weeks ago he came out with no trimming & took champion. Our December born ram & ewe lambs retained for breeding include some excellent progeny of this ram. In fact our entry for Worcester Premier sale this year includes four sons - one shearling ram (which we have used ) & three ram lambs. All rams entered for the Worcs. 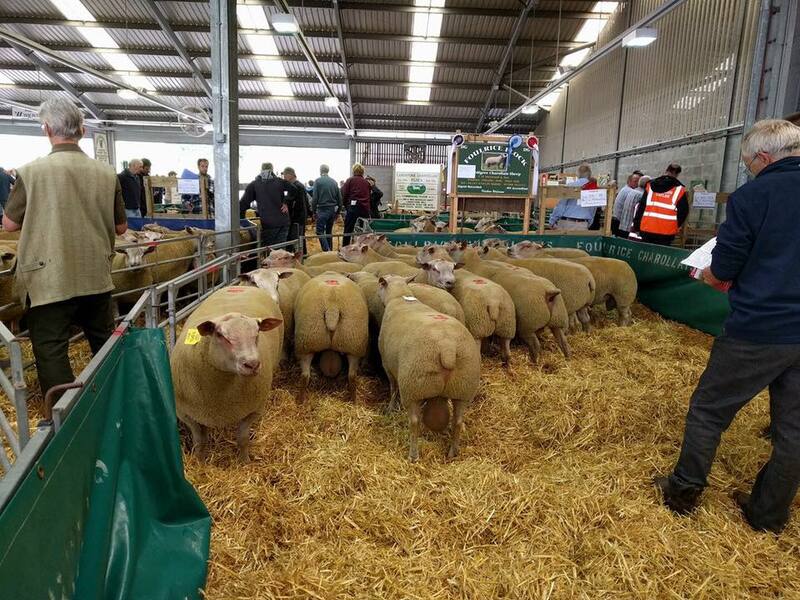 sale this year have to be R1 scrapie genotype, & having sampled 10 shearling rams & 30 ram lambs - all of them came back as R1 genotype; which not only has given us plenty of choice but we reckon that our flock must now be upwards of 100% R1 genotype. Osprey`s shearling son for Worcs.is following in his sire`s footsteps with an index of 362, a loin muscle top 1% , & gigot muscularity of top 1% which he in turn is passing on to his offspring.This ram who we have named Foulrice Prometheus is only for sale as his sire is breeding so well.